If your spouse will be attending, please enter his/her name. Join with us May 16-17 at the fifteenth annual Latter-day Saint Home Educators Conference to fill your mind with great ideas and your heart with camaraderie and inspiration. You will be blessed to hear from renowned experts and veteran homeschool parents on a wide variety of timely topics. Spend some time perusing the wonderful items in our Marketplace and chatting with the creators of some excellent educational products and services. Enjoy our evening activities, including our Mentor Moms Chat Room, family dance, and youth talent show. And if you're bringing your spouse and younger children, be sure to check out all the fun activities planned for the dads and kids during the day. 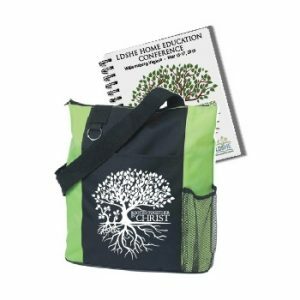 You will walk away with lifted spirits, new friends, and a renewed determination to make your homeschool a blessing in the lives of everyone in your family—including yourself! As always, spouses are free at LDSHE. Each couple will receive a complementary Conference Guidebook filled with the collected wisdom of our presenters from all three seminars, along with an LDSHE totebag (not guaranteed for those registering after April 24th, when we must place our orders for totes and guidebooks). Additional books and bags can be purchased during check-out if needed. If you are interested in attending both the Wednesday Focus Seminar or the Wednesday Beginner's Seminar and the Thursday/Friday Home Education Conference, you can use the Three-Day Package on the main registration page to save money. Note: Adult classes are for adults and quiet infants only. Taking noisy babies out is a courtesy to the presenter, other attendees, and future listeners of the audio recordings. A mothers' lounge—with a live video feed—will be available. Children younger than twelve are not permitted in classes or activities specifically for youth. Younger siblings may not attend classes or activities specifically for the youth. We know it can be difficult to find child care for the toddlers through tweens group, but allowing yourself to enjoy the conference experience in peace is worth it!